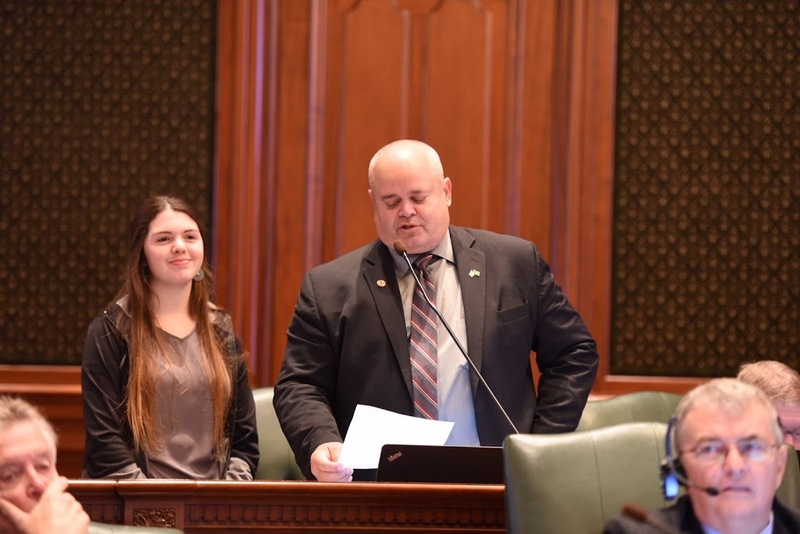 WOODHULL… State Representative Dan Swanson (R-Alpha) hosted Princeton resident McKayla Bartkiewicz as an Honorary Page in the Illinois House on Thursday, October 26th. McKayla is a sophomore at Princeton High School where she is on the Golf Team and a member of the German Club. McKayla was also nominated to serve on State Senator Chuck Weaver’s Youth Advisory Council. Rep. Swanson asked the Illinois House, in introducing McKayla, to take a moment of silence for McKayla’s father, SPC Christopher Bartkiewicz, who was killed in the line of duty in Operation Iraqi Freedom in September 2008. It was the Illinois House’s sincere honor to recognize McKayla Bartkiewicz both as a Gold Star Daughter but also as an Honorary Page in the Illinois House. McKayla was accompanied to Springfield by her grandmother, Carol Hubbard.